Military men often suffers from injury and post-traumatic disorders, which subject them to chronic pain. Both veterans and those in active duty often seek medical advice. They are often given prescription drugs to manage chronic pain. Unfortunately, some painkillers can cause dependence; users tend to rely on them increasingly as time goes by. Aside from addiction, users may also experience adverse drug reactions and even death. According to the Journal of the American Medical Association, veterans from Afghanistan and Iraq were found to have the greatest incidence of post traumatic disorder. For this reason, most of them may have received prescriptions unfit for their condition. The national program director, Dr. Robert D. Kerns, of the Department of Veteran Affairs find studies on alternative management for pain beneficial because it motivates his department as well as Pentagon management to look for alternative ways to relieve pain among veterans and active duty men. Chiropractic care came out at the top of the list of the most effective alternative treatment for painful conditions such as acute low back pain and other spinal disorders. Even the non-profit organization, Joint Commission, revised their Provision of Care, Treatment and Services to include chiropractic care as one of their recommended non-pharmacological approach to pain management. 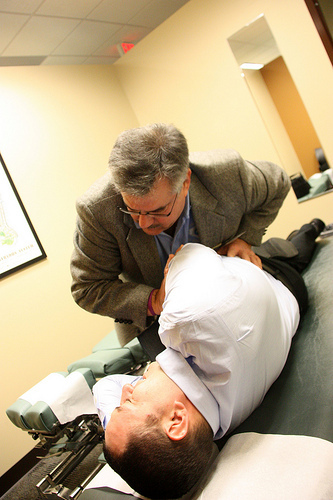 Chiropractic care has been a popular method of relieving pain especially those associated with the spine. Many low back pain patients report pain relief after a few visits to the chiropractor. Instead of turning to long-term medication or spinal surgery, these patients first seek chiropractic care and luckily, they reported better health outcomes. This enabled them to save money from unnecessary spinal surgeries. Combined with standard medical care, chiropractic care proves to have about 75% effectivity in relieving or minimizing pain among active duty patients suffering from low back pain.